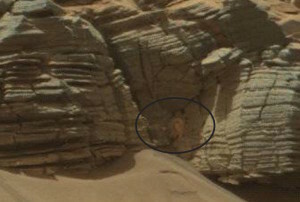 It’s definitely not a giant crab lurking in a cave. In fact, it’s just one more example of the sometimes whimsical, always spooky phenomenon known as pareidolia, or the tendency of the brain to see familiar shapes—especially faces—emerging from random patterns. In fairness to the folks freaked out by the current image, a crab is not a face and the brain has to work a little harder to force that image out of the background shapes, but it does the job all the same—just as it will interpret a branch in the underbrush as a snake or a shadow in the closet as a monster. Your pattern recognition regions are not the smartest part of your brain, but they’re not designed to be. They only have to be right once, and on the off chance you ever do run across a bear in the woods or a crab monster on Mars, you’ll have your fusiform gyri to thank for keeping you alive.